Sponsors and Supporters will get a chance to kart race against celebrities in a fun, thrilling grand-prix-style competition. 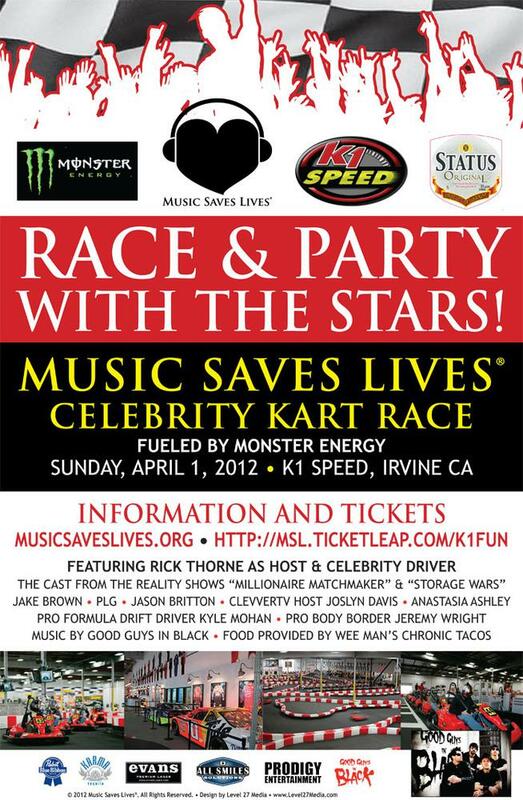 Attendees will enjoy great food, drinks and can bet on celebrity kart racers. This red carpet event will also have live entertainment, a silent auction. Many of the athletes will be displaying their racecars and motorcycles offering pictures and autographs. Music Saves Lives is a nonprofit that has focused its main efforts on blood donation and marrow registration, reaching out by sharing facts and educating young people on music tours nationwide. MSL began in 2006 and has reach out to more than 2 million youth blood donors and registered over 20,000 for the marrow program saving as many as 15 people with leukemia. Their efforts have changed lives across the US and in Canada.